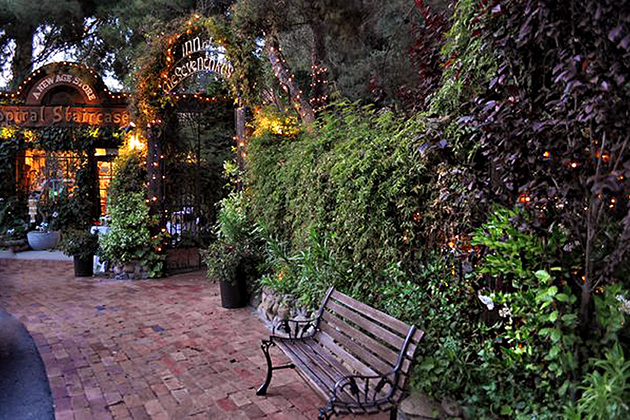 ...dine by candlelight under the stars, grand old sycamores, waterfalls along winding brick pathways. We offer an atmosphere unlike any other in the Los Angeles area, and a chef who is constantly reimagining what great food should be. Join us and be touched by the magic. Brunch Buffet on both Saturday and Sunday! The Inn of the Seventh Ray's famous buffet brunch is expanded for Easter Weekend. Join us next to a lovely flowing creek in the Santa Monica Mountains and enjoy what Thrillist calls "possibly the best brunch buffet you’ll ever have." An organic, healthful feast that includes King Crab, Leg of Lamb, Duck Bacon Eggs Benedict and an astounding variety of vegan, raw, and gluten-free salads and pastries. Perfect for families of all sizes, there will be a continuous Easter Egg Hunt throughout the Inn's grounds on Easter Sunday. Brunch is not for just Saturday and Sunday anymore. The Inn is now serving breakfast and lunch every day of the week! From 10am - 3pm Monday through Saturday, and from 930am - 3pm on Sunday. What better way to spend your Sunday than relaxing at the intersection of two creeks under old sycamores and oaks, enjoying a lavender infused mimosa or freshly squeezed juice? Boasting more than fifty locally-sourced, organic dishes, our Sunday Buffet Brunch is typically touted as one of the best in Los Angeles. For those of you just in for a quick bite on your way to or from the beach, we also offer an a la carte menu complete with omelettes, quiches, and lunch entrees.